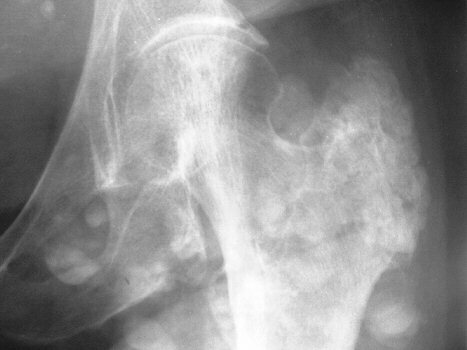 Xrays show diffuse calcification in the tissues of the right thigh as well as the left. The bone stock is relatively normal. When she first presented ten years previously the patient had a small calcified mass near the greater trochanter R. Biopsy showed calcification in the soft tissues. She has chronic renal failure. 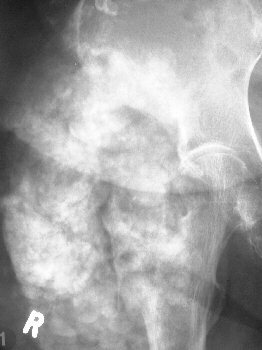 The lesions have since progressed to the diffuse calcification seen about both hips in the X rays on this page. There are no aggressive features such as erosion of bone that may suggest malignancy.